My almost 6-year-old son used to have a few yoyos, but he only has one left right now. This is the yoyo that he got for the tickets that he earned from playing games at Tom’s World. 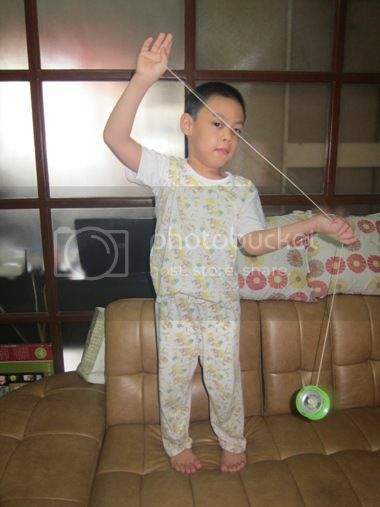 He likes playing his yoyo, but he gets frustrated when he can’t make his yoyo work. That’s because the string of the yoyo is too long. Why we never thought of cutting the yoyo string to its correct length is beyond me. Whenever the little boy plays his yoyo, he has to stand on our sofa bed so the yoyo won’t hit the ground. This works sometimes, but not always. His yoyo occasionally falls to the ground with a soft thud. I won’t be surprised to see this yoyo broken one day, and I’m sure he’ll ask for a replacement. Well, if he does, I’ll make it a point to buy a stronger and more durable yoyo for him, like a Duncan yo yo. I’m sure I’ll get my money’s worth if I do that. ← McDonald’s Happy Meal Toys for the Little Boy!